Third album from these California-based heavy metal monsters Cirith Ungol. After releasing two nearly flawless albums, they gained some pressure on their shoulders from the fans and the new label. Metal Blade signed Cirith Ungol after the rather successful and critically acclaimed King Of The Dead. I haven’t given that one a respectable amount of spins yet, so I cannot entirely tell the differences. However, this seems to be more stripped down and more direct in terms of songwriting, and it has an audibly “better” production. This may be due to their mentioned label change, and the departure of Greg Lindstrom. Which impact did all these changes make? Would this be accepted as another cult masterpiece? Was it as good as their previous work? And most importantly, how did it sound? As I’ve already mentioned, this may have had an impact on their musical framework. The changes I’ve picked up myself are that there are no acoustic passages or extended lead breaks. Relax; there are a lot of great leads for you to motorboat in. This is maybe stripped down a little, but this is nonetheless a must-have if you like this band. The production is clearer yes, but their sound is still thick and juicy. The only complaint I have is that the dominant bass-playing is not as audible as it used to be. Another thing that grabbed me was the excellent lead work on here. I knew Jerry Fogle (R.I.P) was good after listening to Frost and Fire, but I got completely blown away by some of the stuff he does here. War Eternal is, if there have to be one, one of the weaker tracks here, and the way that solo at the end just lifts it through the roof is just amazing. His tone is thick as a brick wall, loaded with passion and emotion and he is, without a doubt, very highly skilled. Tim Baker’s unique vocals still seem to have a bad reputation among various fans, but no-one can deny the identity this guy provide Cirith Ungol. He shifts between high-pitched raspy snarls and deeper rumbling croaks, and without him this band wouldn’t be the same at all. Time for a little sneak peak into the various songs on One Foot In Hell. Blood & Iron starts it all off with classic galloping riff work and is somewhat catchy. This is probably one of the fastest songs here, and definitely a good way to kick off this incredible slab of heavy metal. The slower, more doom-y Chaos Descends embraces your tympanums with an apocalyptic sound and great melodies. Barker really gets time to shine here, and mixes up various vocal styles on the mighty chorus. Some great lead-work by Fogle on an almost Maiden-esque outburst towards the end, perfects this one. The first of many highlights, and my personal favorite. After the more straight-forward rocker The Fire, Cirith Ungol shows off some slight progressive rock-ish influences on the mightyNadsokor, operatic backing vocals travels trough time to Seventh son-era Maiden, and I almost sense some black metal lurking in the gloomy, atmospheric parts. 100mph gains speed, and cracks out an early heavy metal anthem at full power, before War Eternal and the slow Doomed Planet slows things down prior to the mighty title-track. Packed with top notch performance from every single band member, it closes a worthy successor of the mighty King Of The Dead. I don’t understand fans who label this lackluster or commercial or whatever stranger things they want to call it. This is nothing but solid, distinctive and outstanding heavy metal that nearly no-one does better. 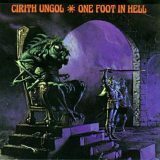 Cirith Ungol will forever be the unsung heroes of classic heavy metal, they will forever hold a place in the metal underground as one of the finest bands to ever come out of it. They released four great albums, and managed to color the genre with their presence, never drowning in the sea of newborn bands in the eighties. Get this one, and get ready for a journey through the pass of the mighty freakin’ spider.